The 2009 OVGE was a blast! Upon arrival at the show, I discovered that my camera had dead batteries and promptly forgot all about my cell phone camera once I entered the doors. The expo was hosted in the beautiful new Spirit Bank Event Center and had an excellent variety of games, consoles, and accessories to rummage through. 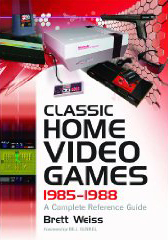 I made several laps around the room and made sure to pick up Earl Green's Phosphor Dot Fossils Level 2 DVD and Brett Weiss's book Classic Home Video Games 1985-1988. I also managed to pick up a few other small items, including a few Vectrex carts, a trackball controller for my Atari 5200, an NEC Turbografx 16, a Commodore VIC-20, and a huge stack of games. My little sister, who tagged along, came across an Earthbound cart, a game she's been dying to play on the Super Nintendo. I had a blast playing a Space War arcade machine with one of the exhibitors and was able to meet up with several people from the Oklahoma Coin-Op Collectors forum and the Digital Press forum. Hopefully I'll have things arranged a bit better for next year so I can have an exhibit, too!